JEE Main Counselling 2018 is going to be conducted by Joint Seat Allocation Authority in six rounds. The JEE Main Counselling Schedule is going to be conducted for 31 NITs, 20 IIITs and 18 GFTIs which the institutes participating for JEE Main 2018. The JEE Main Counselling Procedure 2018 is going to be conducted in online mode, while registration will tentatively start from the first week of July 2018. 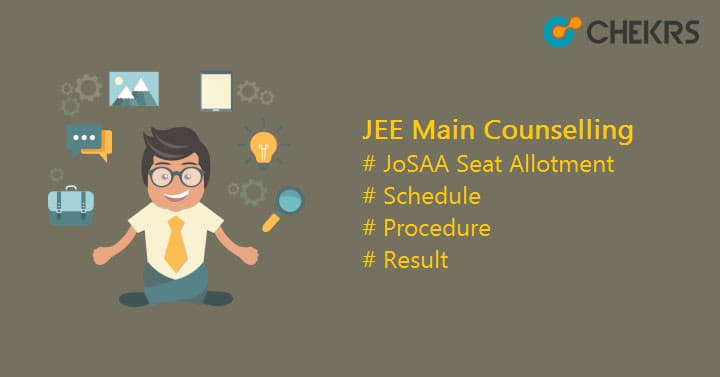 Therefore all the candidates who successfully qualify JEE Main 2018 will participate in JoSAA Counselling 2018 along with JEE Main Seat Allotment process. In regards to more details go through the article and get complete information. Latest Update 4 July: JEE Main/ JoSAA Second Round of Seat Allotment will be done today 4 July 2018. JoSAA JEE Main Counselling is the process of admission in which all the qualified candidates of Joint Entrance Examination 2018 will be allotted their respective course and college according as per merit list and availability. Check below the precise details of JEE Main Counselling process. Now click on Choice Filling & Locking option and choose the option as per your choice. A maximum number of choices can be done. Availability of seats in different seat categories. Payment of Fee: Candidates must make payment of fee for the allotted seats through SBI Net Banking/e-Challan. Qualified candidates must report to their respective institute and carry the below-mentioned documents along with two sets of photocopies. Joint Seat Allocation Authority is going to conduct JEE Main Counselling 2018 for providing admission into various colleges as per different courses. Candidates will be provided their respective seats through JEE Main Seat Allotment process. To receive the latest updates on JEE Main Counselling Results, keep visiting our portal www.entrance.chekrs.com and we will also notify you latest updates of Top Engineering PG colleges.